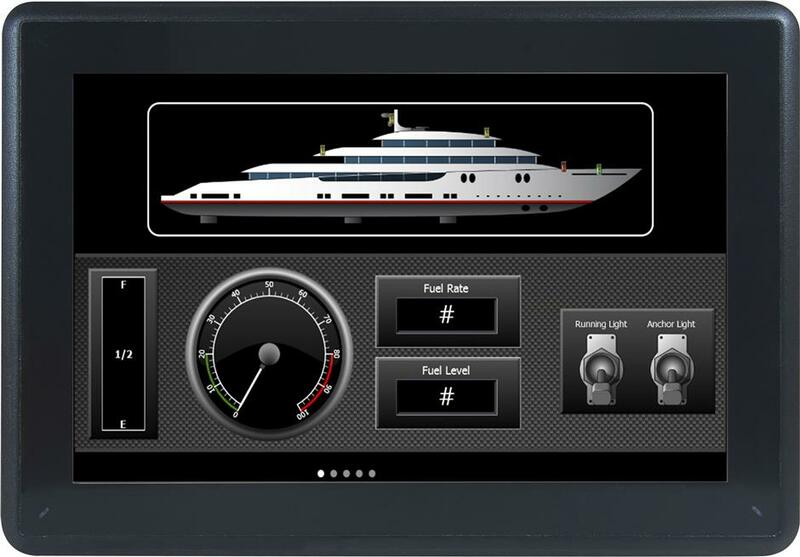 The black panels are marine certified in 7" (PP874M) and 15.4" (PP885M, PP885H) sizes, with high resolution touch screen displays. Their classic black enclosure offers low light reflection and seamless integration for all on-board applications. Dimmable backlight to suit varied ambient light conditions, and high brightness for outdoor use in bright sunlight. A fully deployable HMI with comprehensive and integrated templates and libraries for every conceivable process. The Panel Builder tool, with familiar Microsoft® Windows® environment along with multiple language support results in remarkably quick, easy and efficient engineering. Panel 800 is constructed in a strong yet lightweight diecast, powder-coated aluminum housing. (IP65/IP20 for PP874M), (IP66/IP20, NEMA-4X for PP885M and PP885H) front casing withstands wet, dusty and demanding environments. Operating temperatures ranging between -15° C to +55° C with maximum 85% humidity.